I have to say that I’m really consistent about working with live models. It’s to the point where I prefer to deal with live people instead of photo references. I had the opportunity to work with two models yesterday. I sat in on a local college Drawing class earlier in the day, and the next model was at the Norfolk Drawing Group. I’m a regular at the group, and I’ve noticed that my art has improved because of these sessions. Reclining poses are one of the hardest poses to work on. It’s even harder to deal with when you’re work with contour lines, and then you block in the shapes and shadows. Most art teachers would scold me for the way I approach the figure. Instead of sketching out the whole body, I usually start with details first. Working my way down from the head to the feet. There’s not too much room for error with this technique. I visually measure where everything should be, and my knowledge of general perspective allows me to do so correctly most of the time. My current medium of choice for sketching models are Prismacolor pencils. You can create a lot of detail if you keep the pencils sharp. I’m working on Canson Toned Pastel paper which actually has a smooth side and a heavy texture side. The smooth side is great for sketching and if you work light enough, it’s even possible to erase mistakes. I’ll usually go back over any light line work. I typically never blend the Prismacolor pencils. Things tend to get messy, and I like controlled gradients in my work. Ok. This is what happens when I spend way too much time on the model’s head. I really strive to capture the likeness of each model. That fact alone can slow me down at times. Even with a long pose. Certain aspects of his head wasn’t looking right, and I’m still not happy with the final results. I probably spent 30 minutes trying to get a decent likeness, and I constructed the rest of the body in about ten minutes. I’m really upset that I didn’t get a chance to add more details. The lighting on the model looked really good. I’m planning to sketch two models together next week, and then it’s time for a special long pose with a burlesque dancer in the evening. 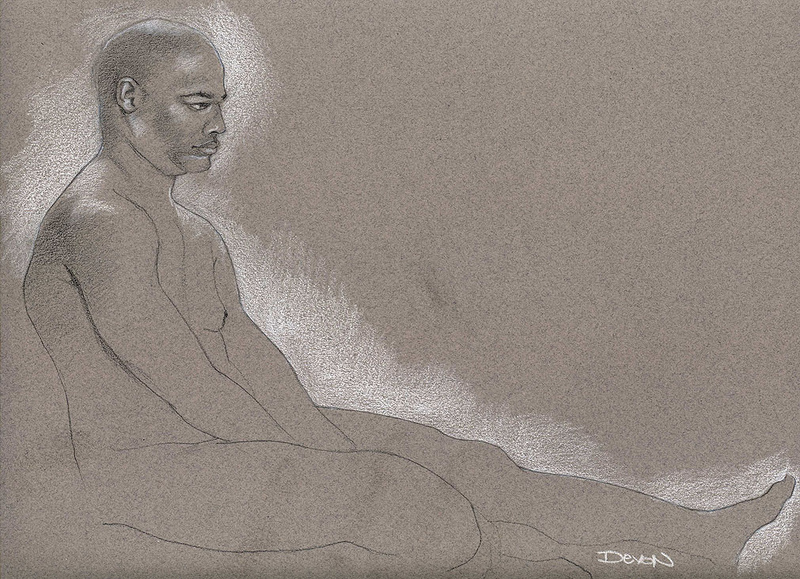 This entry was posted on Wednesday, April 13th, 2011 at 11:51 pm	and posted in Figure Studies. You can follow any responses to this entry through the RSS 2.0 feed.